This comprehensive overview of the history of computing and its industry, and of commercial applications of the computer also outlines the history of how computing operations were managed within American companies. Based on extensive research in the contemporary business literature, this work is one of the few which looks at computing as business history, and it is the first to look at the broad scope of computing from the perspective of the business historian. The work is also directed at business managers to help them appreciate and understand the uses of the computer in their firms. …looks at computing as business history…from the perspective of the business historian and business manager. The relative impact of the use of computers and the intensified reliance on information as an input, product, and integral part of the modern business experience are topics of great significance. Cortada presents a thorough, well-written, and extensively documented overview of the current state of research into the history of computing and data management, providing examples, demonstrating alternative approaches, and suggesting viable issues that deserve more reflection and analysis. Written as a detailed and extensive bibliographic essay, this book provides some of the material necessary for researchers with diverse interests to examine the effects and implications of information technology....with this study [Cortada] provides a great service to other historians by encouraging and assisting in further historical analysis. Novices and experts alike will find interesting and worthwhile issues raised and be induced to frame new questions and develop new research projects. Recommended for upper-division undergraduate through practitioner collections. 5. 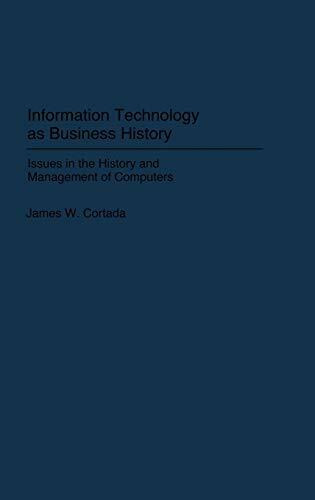 Information Technology as Business History: Issues in the History and Management of Computers (Contributions in Economics & Economic History) [Hardcover] Cortada, James W.